Intelligence Preparation of the Battlespace is the Marine Corps-specific version of IPB related to the Marine Corps Planning Process (MCPP), with Marine Corps terminology and phrasing, whereas “Intelligence Preparation of the Battlefield” is the U.S. Army version with Army-specific terminology and phrasing. Intelligence Preparation of the Battlespace (IPB) is the systematic, continuous process of analyzing the threat and environment in a specific geographic area. Intelligence Preparation of the Battlefield (IPB) is the systematic process of analyzing the mission variables of enemy, terrain, weather, and civil considerations in an area of interest to determine their effect on operations. * Editor’s Note: Since ATP -201/MCRP 2-3A is a dual-designated Army and Marine Corps manual, terms and phrasing specific to the Marine Corps are provided in italics. The G-2/S-2 begins preparing for IPB during the generate intelligence knowledge task/problem framing step. The intelligence staff creates data files and/or databases based on the operational environment. Given the limited time available to collect and evaluate information, this information may not be specific enough to support the military decisionmaking process (MDMP)/Marine Corps Planning Process (MCPP). However, this information helps create the operational environment frame during the design methodology. IPB results in the creation of intelligence products that are used during the MDMP/MCPP to aid in developing friendly courses of action (COAs) and decision points for the commander. Additionally, the conclusions reached and the products created during IPB are critical to planning information collection/intelligence collection and targeting operations. Defining the operational environment results in the identification of significant characteristics of the operational environment that can affect friendly and enemy operations. This step also results in the identification of gaps in current intelligence holdings. Step 1 is important because it assists the commander in defining relative aspects of the operational environment in time and space. During step 1, the intelligence staff must identify those significant characteristics related to the mission variables of enemy, terrain, weather, and civil considerations that are relevant to the mission and justify that analysis to the commander. Failure to identify or misidentify the effect these variables may have on operations can hinder decisionmaking and result in the development of an ineffective information collection strategy/intelligence collection strategy and targeting effort. Understanding friendly and enemy forces is not enough; other factors, such as culture, languages, tribal affiliations, and operational and mission variables, can be equally important. Defining the significant characteristics of the operational environment is essential in identifying the additional information needed to complete IPB. Once approved by the commander, this information becomes the command’s initial intelligence requirements. This focuses the command’s initial information collection efforts/intelligence collection efforts and the remaining steps of the IPB process. For the Marine Corps, the term “operational environment” is consistent with the need to study and learn as much as possible about a situation. Essentially, commanders analyze the operational environment in order to determine the physical dimensions of their battlespace in the form of areas of interest, influence, and operations. Once the intelligence staff has identified in step 1 of IPB the significant characteristics related to enemy, terrain, weather, and civil considerations of the operational environment, step 2 describes how these characteristics affect friendly operations. The intelligence staff also describes how terrain, weather, civil considerations, and friendly forces affect enemy forces. This evaluation focuses on the general capabilities of each force until threat/adversary COAs are developed in step 4 of IPB and friendly COAs are developed later in the MDMP/MCPP. Finally, the entire staff determines the impact and effects to the population of friendly and enemy force actions. If the intelligence staff does not have the information it needs to form conclusions, it uses assumptions to fill information gaps—always careful to ensure the commander understands when assumptions are used in place of fact to form conclusions. The purpose of evaluating the threat/adversary is to understand how a threat/adversary can affect friendly operations. Although threat/adversary forces may conform to some of the fundamental principles of warfare that guide Army/Marine Corps operations, these forces will have obvious, as well as subtle, differences in how they approach situations and problem solving. Understanding these differences is essential in understanding how a threat/adversary force will react in a given situation. Threat/adversary evaluation does not begin with IPB. The intelligence staff conducts threat/adversary evaluation and develops threat/adversary models as part of the generate intelligence knowledge task of support to force generation. Using this information, the intelligence staff refines threat/adversary models, as necessary, to support IPB. When analyzing a well-known threat/adversary, the intelligence staff may be able to rely on previously developed threat/adversary models. When analyzing a new or less well-known threat/adversary, the intelligence staff may need to evaluate the threat/adversary and develop models during the mission analysis step of the MDMP/problem framing step of MCPP. When this occurs, the intelligence staff relies heavily on the threat/adversary evaluation conducted by higher headquarters and other intelligence agencies. In situations where there is no threat/adversary force, the intelligence analysis conducted and the products developed relating to terrain, weather, and civil considerations may be sufficient to support planning. An example of this type of situation is a natural disaster. During step 4 the intelligence staff identifies and develops possible threat/adversary COAs that can affect accomplishing the friendly mission. The staff uses the products associated with determining threat/adversary COAs to aid in developing friendly COAs during the COA development and selecting a friendly COA during COA steps of the MDMP/MCPP. The identification and development of all valid threat/adversary COAs minimize the potential of the commander being surprised by an unanticipated enemy action. Failure to fully identify and develop all valid threat/adversary COAs may lead to the development of an information collection strategy/intelligence collection strategy that does not provide the information necessary to confirm what COA the enemy has taken and may result in the commander being surprised. When needed, the staff should identify all significant civil considerations (this refers to those civil considerations identified as significant characteristics of the operational environment) so that the interrelationship of threat/adversary, friendly forces, and population activities is portrayed. The staff develops threat/adversary COAs in the same manner friendly COAs are developed. Although written specifically as a guide to develop friendly COAs, the COA development discussion in ADRP 5-0/MCWP 5-1 is an excellent model to use in developing valid threat/adversary COAs that are suitable, feasible, acceptable, unique, and consistent with threat/adversary doctrine. Although the intelligence staff has the primary responsibility for developing threat/adversary COAs, it needs assistance from the rest of the staff to ensure the most accurate and complete analysis is presented to the commander. 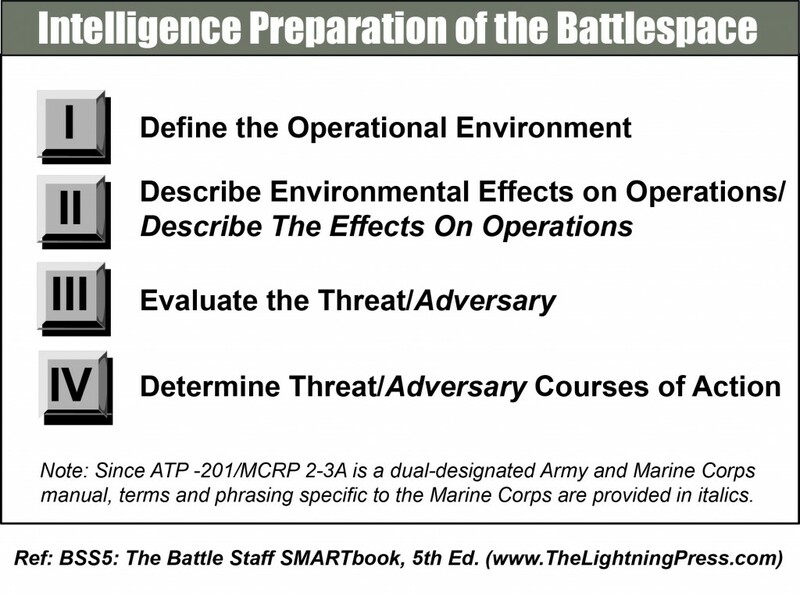 The four steps of theIntelligence Preparation of the Battlefield (IPB) process are covered in complete detail in 44 pages of chapter 3 in BSS5: The Battle Staff SMARTbook, 5th Ed. (Leading, Planning & Conducting Military Operations). Read more about the marine corps planning process (MCPP) and the rapid response planning process (R2P2) in MEU2: The Marine Expeditionary Unit SMARTbook, 2nd Ed. (Guide to Battle Staff Operations & the Rapid Response Planning Process).